I can't understand why these figures are so scarce. My Local Target never got wave 2, and to add salt to the wound...the toy section Target employees informed me that they will not be carrying Mego anymore. I don't know, but I feel that Target isn't capitalizing on the Mego rebirth. 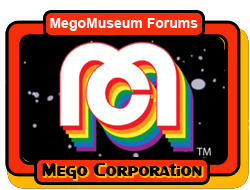 They're acting more like anti-Mego from the 5 local Targets that I've visited so far. 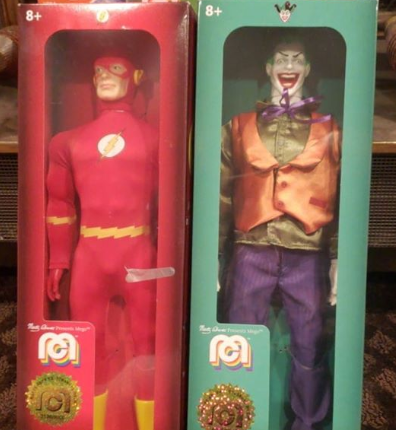 Say hello, again, to Flash and Joker. A fellow collector scored the Romulan, Cowardly Lion, and the Screaming Werewolf at Mall 205, and got a second Werewolf that went to me, joy of joys! The joker really looks BAD! Untucked shirt? No Jacket? WTH? I feel like he should have a turtleneck. But the face reminds me a bit of Gene Hackman. I love that the kryptonite is included again, ha! I am not sure though. I think of the 4 from wave 3 I like Flash the best! Last edited by Mary Canary; Oct 22, '18 at 1:04 PM. Reason: Typo. This is the only character that it makes sense! Lex looks pretty cool. Looks like the collar is stuck under the black straps. They should have taken more care to have the collar over the straps. Joker looks really bad. The head is pretty good, but no purple jacket? Who came up with that decision? Really poor choice. This is crazy! I still haven't seen Spock or the last Charmed figure, but I felt like I was done with the running around for a bit. I have seen restocks of Wave 2 though, as they seem to be selling better than Wave One around me, but they are starting to backlog a bit, especially Bewitched and Kelly Bundy. I hope that doesn't affect Wave 3 in my area. Lex is wearing my favorite costume... glad to see the old Power Suit again. So....were they not allowed to release a classic Aquaman due to the movie line? Hopefully a future wave has Shazam, as that could coincide with the film release and I haven't heard of a toy line for it. All times are GMT -5. The time now is 7:25 PM.